HPMC Technology | C&C Organics Pvt. Ltd. In Soft Gelatin capsules there is minimum 30% wastage of gelatin which is supposed to be the best media for bacterial growth and may cause serious environment hazard. Soft Gelatin capsules are washed after filling with Organic compounds such as Carbon Tetrachloride, or Benzene, etc…. (which are toxic in nature) & finally remains on the capsule surface as residues are harmful to the consumer. Since these products are meant for long term usage one cannot afford to take this risk. Simple fill & seal process. Nature caps : HPMC option. Semi Solid Matrix forms cover formulations with wide range of viscosities. Useful to fill the product with melting points up to 70°C. Can be coated for G. I. Tract Physiology for delivery to specific area of absorption by providing external coating to these capsules after filling. Incompatible drugs in single dose. Biphasic Fills – More than one formulation per capsule. Combination Fills – Liquid & Pellet / Liquid & Tablet / Liquid & Capsule. Preference for convenient liquid & solid delivery system. The capsule dosage form has been rated the best and most preferred. Therapeutic trials show that liquids are faster absorbed by the body than solids. 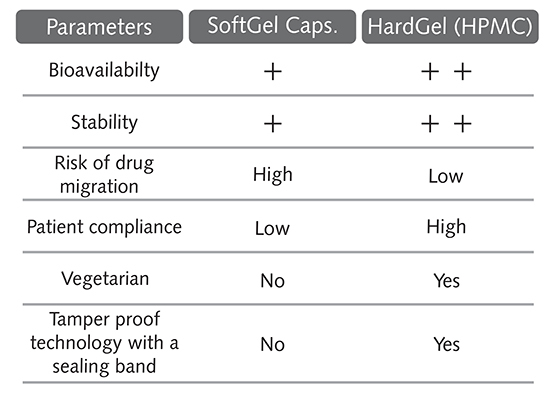 There is no migration of the drug through the capsule unlike in case of other dosage forms such as the soft gel capsules. This means no unsightly spots on the product surface, no leakages due to product migration and freedom from product odour. Lower dosage frequency translates to higher patient compliance to therapies. Liquid filled two piece capsules help reduce multiple dosages with various forms of combination options such as Liquid + Granules/ Pellets/ Tablets/ Capsules). The novel appearance of liquid in a hard capsule, versatile design options, and tamper proof technology also helps in better patient acceptance. 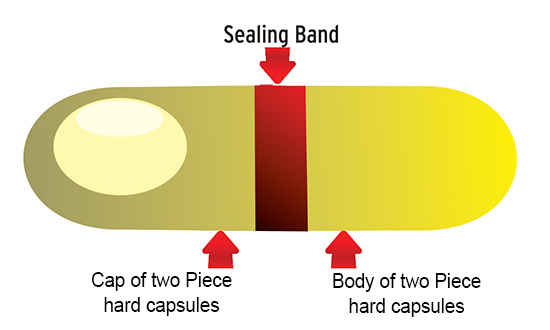 Liquid filled two piece capsules technology helps manufacturers add a sealing band over their capsule product, thus forming a tamper proof shield around their product. If the product is tampered with post band sealing, it will be visibly rendered unfit for patient consumption. The drug is more evenly distributed in the liquid formulation as compared to the solid formulation, leading to a better drug absorption profile in liquid filled two piece capsules as compared to most other solid dosage forms. An alternative to gelatin for those who prefer an animal free product. Those (Vegetarians) with a level of concern about animal-derived products. Consumers looking for the most natural alternative.